The purpose of this thread is to explore the little reviewed areas of the German Air Raid Early Warning, Rescue and Recovery Services. These units were uniformed civilian auxiliaries of the Luftwaffe. The Air Protection League was a different organization whose role was to teach the public about air raid procedures. As the war waned on, this organization's usefulness dissolved, as did its ranks. Despite these organizations initially being volunteer, as the war progressed manpower became scarcer. As a result, personnel were actually conscripted to fill the ranks. 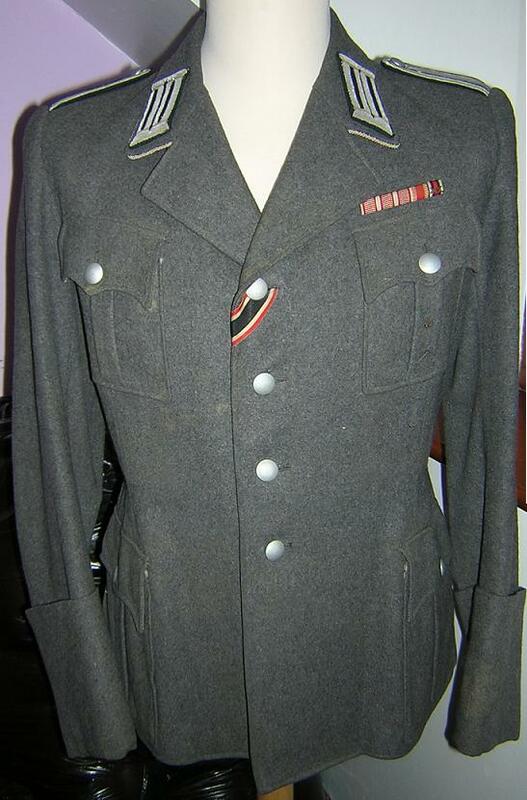 Members of the LSW and SHD were authorized to use Standard Luftwaffe uniforms with their own insignia. These uniforms had special designations of their own. These two units shared the LS breast insignia, helmets with insignia, belt buckles, and cap insignia. The RLB had it's own completely different uniforms and insignia, which I will get into later. This branch was established in 1935. The role of this organization was to provide warning to the various cities and towns of incoming air raids. There was a female branch, known as the Auxiliaries of the Air Warning Service. There were three types of collar tabs. Two were Officer levels and the last was enlisted. 1. The first grade of officer has an unknown ranking level. It consisted of a dark green tab, with wire embroidered "LSW" above an embroidered half wreath, as seen on Luftwaffe Junior Officer collar tabs. 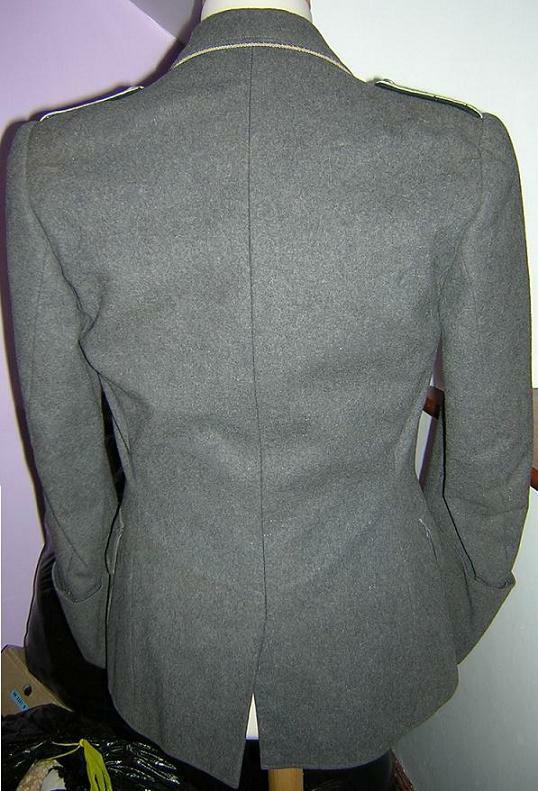 The tab has a silver twist cord outer piping, as seen on officer tabs. Again, the ranks associated with this tab are unknown at this time. 2. The second type is the same as above, but without the half wreath. 3. 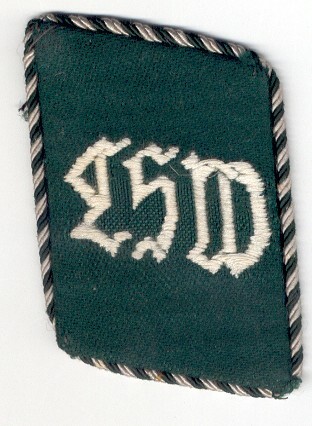 The enlisted version has a dark green face with a white or gray thread embroidered "LSW". 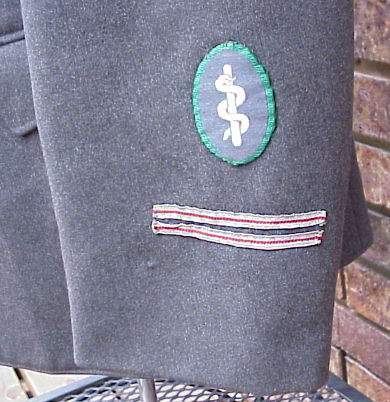 The tab is piped with the green/silver piping as seen on Medium level Luftwaffe Administrative Officials Feldwebel tabs. LSW Gruppenfuhrer- Same as above, but with the addition of 2 silver pips. 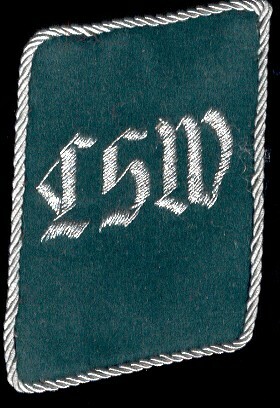 LSW Hauptgruppenfuhrer- 2 cords of dark green flat cord with silver border and 1 silver pip. 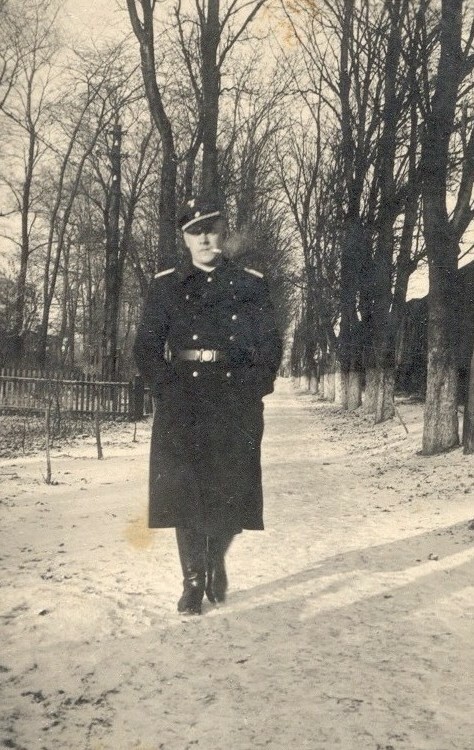 LSW Stabsgruppenfuhrer- Same as LSW Hauptgruppenfuhrer but 2 silver pips. LSW Zugfuhrer- 2 aluminum cords with interwoven center stripe of green cord or threads. LSW Oberzugfuhrer- Same as above but with the addition of one gold pip. LSW Warnzentralefuhrer- Same as above but with two gold pips. LSW Warnzentraleoberfurhrer- Same type of braiding as the Zugfuhrer, but braided into a linear knot. A 5cm green cuff title was to be worn on the lower Left sleeve. Embroidered was, "L.S. Warndienst". There were enlisted and Officer versions. 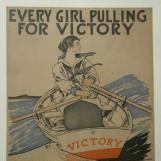 Female auxiliaries utilized an armband with "L.S. Warndienst". Trade badges were worn on the upper left sleeve. They were comprised of a green oval with two crossed lightening bolts and "LSW" embroidered above them. This was for communication personnel. Wreckage Service- White anchor on a blue base with a green border. Fire Brigade and Decon Service- White Gothic "f" on a red base with a light green border. Maintenance Service- White Gothic "I" on a brown base and green border. Veterinary Service- White Gothic "V" on purple base with a light green border. Gas Detection Service- Black letter "G" on a yellow base with a light green border. The SHD was established around the beginning of the war. Its role was to help in the aftermath of an air raid, with the rescue of persons and when possible, property. It was also tasked with ensuring security and guidance during air raids. Due to manpower shortages, the ranks were filled with "draftees". Members were exempted from military service yet not allowed to hold other employment. SHD units were housed in barracks, with a rotation that allowed half of the unit?s personnel to be at home, if the situation allowed. Specific duties included firefighting, rubble clearance, urban search and rescue, building stabilization, medical services, and the procurement and delivery of supplies. Motorized SHD battalions were established on 25November1939. Members were transferred in from the police and fire police to fill the ranks. On 10Mar1942, the motorized SHD Battalions were transferred to the Luftwaffe and re-designated the motorized Air Protection Battalions. They fell under the Luftwaffe Construction Branch. At this point, these former SHD members had found themselves with full soldier status within the ranks of the Luftwaffe(I bet they were surprised). These men had the Black Waffenfarbe and had the letters "LS" on the shouldboards and straps. 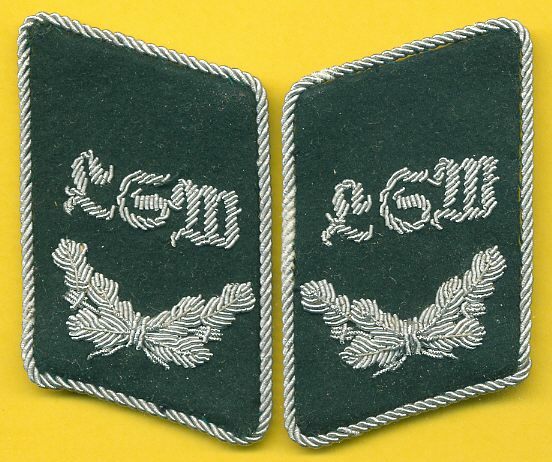 Officers used the gold metal cyphers, NCOs used the silver toned cyphers, and enlisted had the "LS" embroidered using black thread, outlined in white. Cities and towns were given a classification based upon the degree of risk of being assaulted, but this was abolished in 1943. Rankings became that of the regular Luftwaffe. On the 19th of March 1942, the non motorized SHD was transferred to the Police reserve and renamed the Air Protection Police. This new organization fell under the control of the Police. There were two types of collar tabs. 1. Officer. 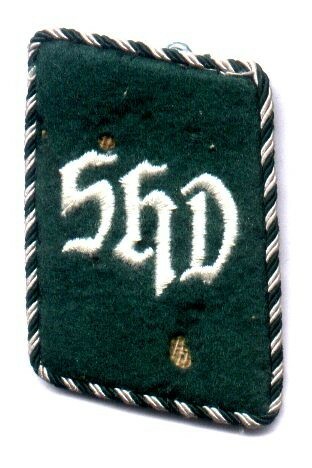 It consisted of a dark green tab, with wire embroidered "SHD". 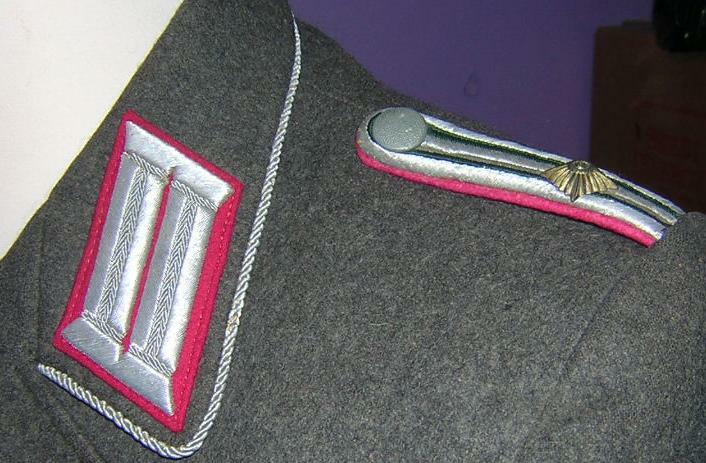 The tab has a silver twist cord outer piping, as seen on officer tabs. All officer ranks used this tab. 2. 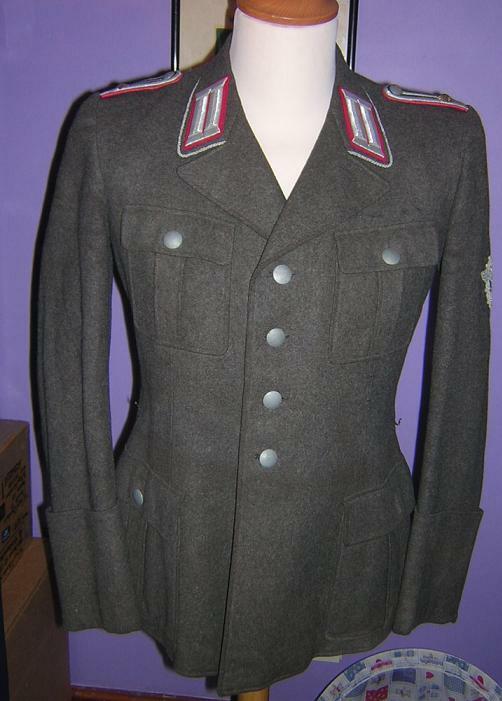 The enlisted version has a dark green face with a white or gray thread embroidered "SHD". The tab is piped with the green/silver piping as seen on Medium level Luftwaffe Administrative Officials Feldwebel tabs. 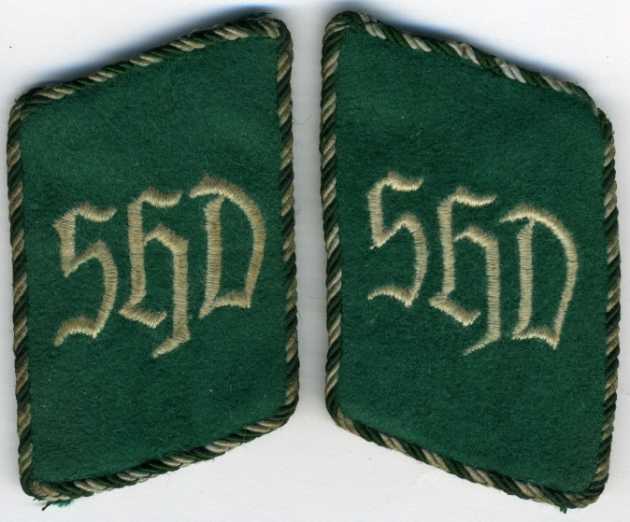 Starting in mid 1939, the primary indicator of rank of the SHD uniform was on armbands. These armbands were dark green with the Gothic inscription embroidered "Sicherheits-u. Hilfdienst" in white, broken into two rows. This armband was worn on the upper Left sleeve. The follow are the grades and how they were shown on the arm band. Grade 2- Same as above but with 8cm long narrow tresse on the upper edge of the band. Grade 3- Same as above but with a narrow strip of tress along the upper edge of the band. Grade 4- Same as above but with 8cm long tress and the edge tress in Grade 3. Grade 5- Same as Grade 1 with narrow tress around both the upper and lower edges of the band. Grade 6- Same as Grade 1 with 1.5cm wide tresse around upper edge. Grade 7- Same as Grade 1 with wide tress along both edges. Grade 8- Same as Grade 7 but with narrow tress around the center of the armband and open between the rows of inscription. 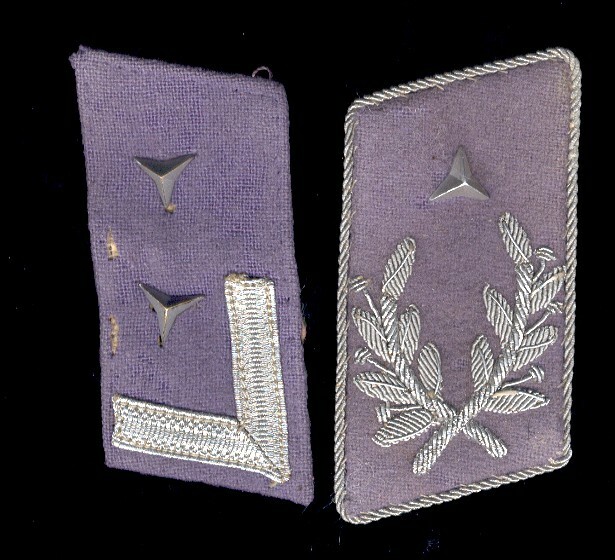 Until 1940, the SHD used armbands to distinguish rank. 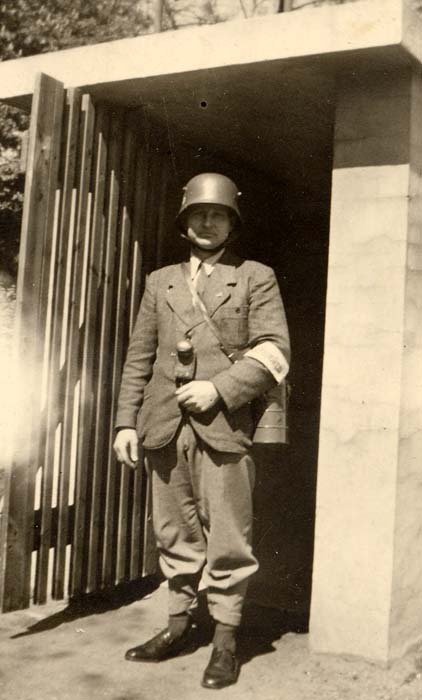 Sometime in 1940, the SHD adopted the LSW like shoulder boards. 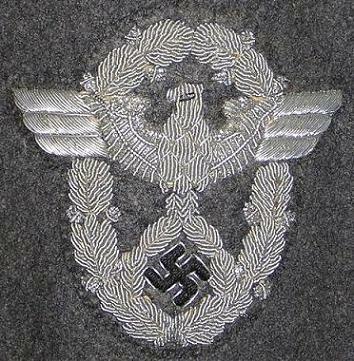 SHD Gruppenfuhrer(Unteroffizier)- Same as above, but with the addition of 2 silver pips. 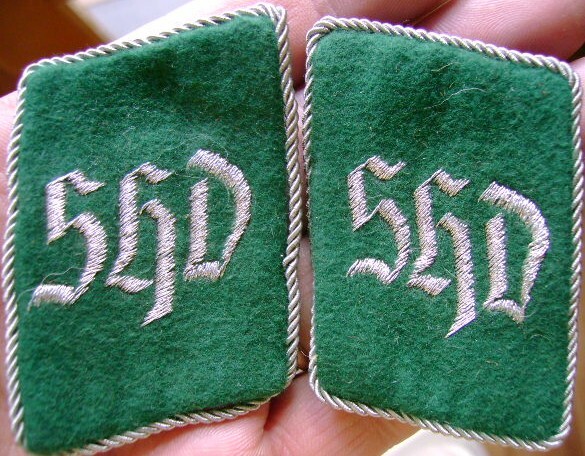 SHD Innendiesnstleiter(Hautfeldwebel)- 2 cords of dark green flat cord with silver border. 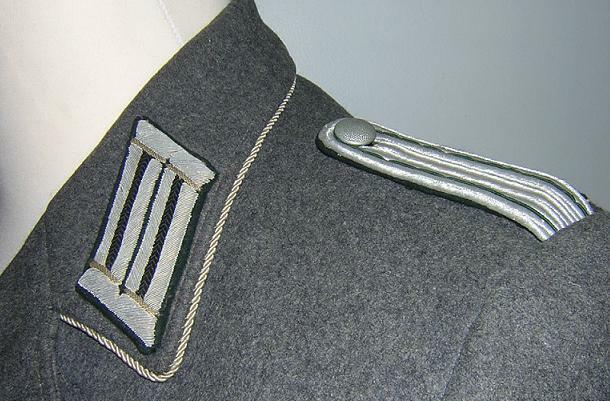 SHD Zugfuhrer(Leutnant)- 2 aluminum cords with interwoven center stripe of green cord or threads. SHD Abteilungsfuhrer(Major)- Same type of braiding as the Zugfuhrer, but braided into a linear knot. SHD Abteilungsfuhrer(Oberstleutnant)- Same as the Major, but with the addition of one gold pip. Medical leaders had cyphers, which set them apart. Medical Service- White staff and snake on a blue-gray cloth circled by a green border. This organization was primary function was to serve as an Air Defense force, during a period when Germany was prohibited from having an Air Force by the Treaty of Versailles. The Reichsluftschutzbund was created in 1933. When the Luftwaffe came out of hiding in 1935, the RLB was primarily used for educating the public on safety and protection, in regard to air raids. As the war waned on, the roles as well as the size of the RLB dissolved into a shadow of it's former being. Other roles played by the RLB were mainly non-combat support roles such as ground crew training and search and rescue. The RLB was under the control of the RLM(Reichs Air Ministry). They had their own distinct uniforms and insignia. The branch color of the RLB was Lilac. This color was displayed on the collar tabs and as an underlay on the shoulder boards. The below link gives a great illustration of rank insignia and uniform of the RLB. Here are a couple collar tab examples. SHD was changed into the Luftschutzpolizei sometime in 1942, if I remember correctly. 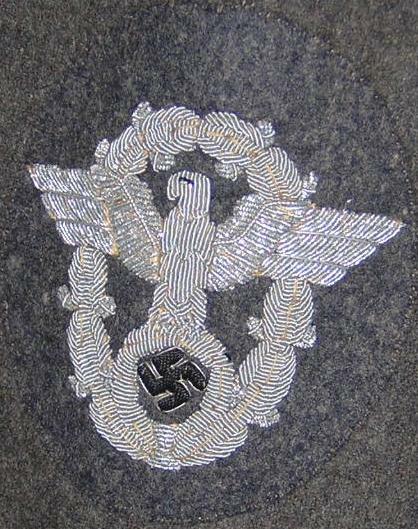 They kept using Luftwaffe uniforms, but the insignia changed completely to normal Schutzpolizei insignia. 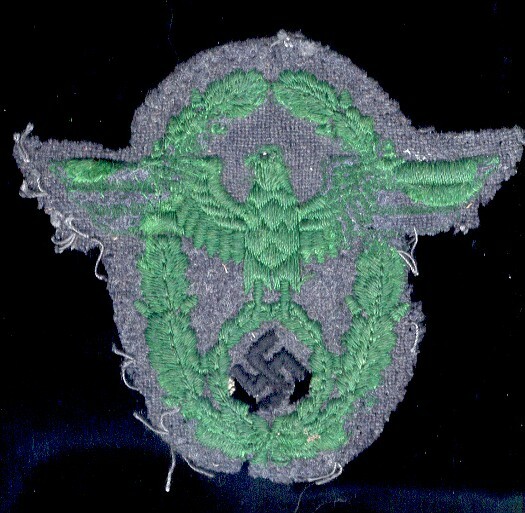 I have never been able to find a LSP green sleeve eagle on Luftwaffe uniform backing. Do you think this person was Luftschutz? If so, could this be an early war or even pre-1939 photo? I can read polizei on his armband. I don't know who he is but found the photo amongst those my wife's g uncle who was in the Luftwaffe. He very well could be some sort of block warden? Very interesting photo! Here are a set of insignias from the Bob Hritz Collection(Thanks Bob). This amazing tunic comes from the collection of George Wheeler! Just completed a deal on these babies!! Here is a RLB winter ensemble! I wonder why they made their photos so small! Surely the average person needed a magnifying glass to see their loved ones, back in the day! Luftschutzpolizei sleeve eagle, albeit quite worn! 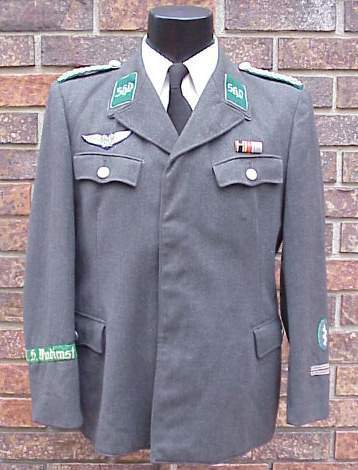 Here is a jacket for the Luftschutzpolizei officers Instandzetsung, repair and rubble removal the collar patches on this jacket are very dark green with Black centre stripes, the black branch colour is for Instandzetsung, the shoulder boards are the normal dark green piping. Of note the other ranks of this branch used black collar patches with a white eagle, a rather strange combination for TR insignia. Thank you so much for these ultra rare examples. I did not even know that this type of tunic existed until you posted them! I dont know how you manage to find all of these! Never seen ANY SHD/LSP uniforms in 40 years. Nice set,congratulation.In good shape to.